Kaneho is a CDP located in the county of Honolulu and the CDP is also part of the city of Honolulu. The CDP is a medium-sized coastal community with around 15 neighborhoods. Kaneohe is approximately the 7th largest community in the state of Hawaii. It is located on the beautiful island of O'ahu in the district of Ko'olaupoko. The name Kane'ohe means bamboo man and is inspired by a native legend about a woman who likened her husband's cruel actions to bamboo with its sharp and cutting edge. The community has a mixed workforce, extreme diversity, and is well-educated. Over 34% of adults in the CDP have four-year degrees or more, which is well above the national education average. English is the primary language in the community, followed by Pacific Island languages and Japanese. It is a nautical community with a tropical savanna climate. It is blessed with a rich history connected to the ocean, beautiful views of ocean and landscape and plenty of waterfront fun. 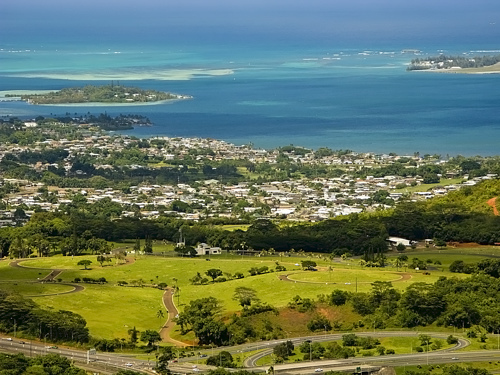 It is primarily a residential community but does have a central commercial area that runs along Kamehameha Highway. The CDP spans 8.5 square miles, 6.6 of land area and 1.9 of water and is a wealthy community in comparison to state and national economic standards. In 2010, the population was 34,597 and the population density was 4,100 people per square mile. By 2016, the estimated median household income in Kaneho was $96,265 and the estimated per capita income was $35,942. In the same year, the estimated median house or condo value was $726,353, the mean price on all housing units was $811,320 and the median gross rent was $1,863. Residents of the community do face a fairly long commute, approximately 31 minutes on average, however, public transportation is available. Public bus services are popular for daily commutes, but the majority of residents continue to drive themselves. Public education in the CDP is provided by the schools of the Hawaiian Department of Education. There are eight elementary schools in the community. Older students attend at S.W. King Intermediate School and James B. Castle High School. There are also charter and private schools in the area, including the Hakipuu Learning Center, Windward Nazarene Academy, Koolau Baptist Academy and others. The community is home to the Kaneho Bay Sandbar. The bay, sandbar and coral reefs attract locals and visitors alike. The area is perfect for snorkeling, beach volleyball, picnics and more. With all the sand and sun residents are encouraged to embrace an active outdoor lifestyle. The community has three golf courses and all are open to the public, Ko'olua Golf Club, Pali Golf Course and Bayview Golf Park. The community is also the home of the beautiful Ho'omaluhia Botanical Garden and the Hawaii National Veterans Cemetery. Homes for sale in the CDP come in a variety of sizes, prices, and styles. Other real estate options include condominiums, townhomes, and apartments. To begin your home search, call local real estate agents Stefanie Cruz and Isabella Holmgren today at 803-348-0697. Learn more about schools near Kaneohe complete with ratings and contact information.